Clicking on a program icon on the Dash. 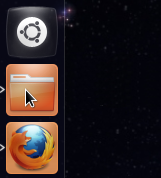 In Ubuntu 12.04 LTS, using Unity, if you have opened an instance of a program, clicking the application icon for that program again will only select the most recently displayed window of that program. Clicking again displays all windows of that program in a scaled down version (á la OSX 2000 or similar). Another way to do it is holding down the Window-key and Shift while pressing the number for the application you want to open another instance of. Holding down the Window-button alone shows the numbers (but the applications on the bar are numbered starting with 1, but excluding the “Dash home”).